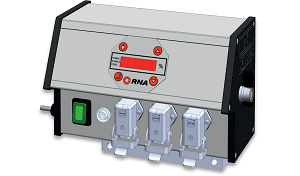 RNA supplies optimum control concepts. These range from low cost units to the self-calibrating high-tech unit with microprocessor control. Intelligent processing of peripheral sensors, tailored to the requirements of feed technology allow communication with hierarchy control systems. Moreover, the control units are available under a CE and CSA/UL licence. * The ESG90 is now obsolete and has been replaced by the ESG1000. * The ESK N80 controller has been replaced by the ESK 2000. * The ESR 01 controller has been replaced by the ESR 2000/ESR3000. Three opto-couplers for status messages and further links (in connection with board ESC06, which is not included in the delivery). Control unit for the operation of one vibratory bowl or linear feeder and connection of a sensor for monitoring and controlling the part flow. At the same time the vibration frequency is manually adjustable.